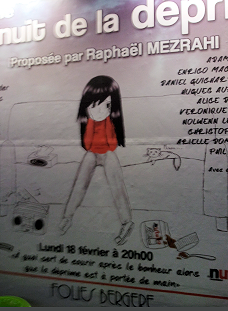 I found this poster in the metro: “The Day of Depression” at the Folies Bergère (a traditional music hall built in the Belle Epoque in the end of the 19th century). 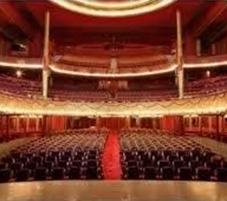 Famous actors and singers will each sing a song or read out a poem, the saddest one they know. It is recommended to be clothed as sober as possible. Two guests will be chosen by lottery and win a trip to the town of Lourdes in France (known for its spring waters, and for being a major place of Catholic pilgrimage). The French people, who are good at enjoying life, are also able to lightly play out their “depression-prone mood” with just a little humor, and artistically! The French composers Debussy and Ravel as well, when expressing a sad tune, somehow maintained lightness without falling into pathos. 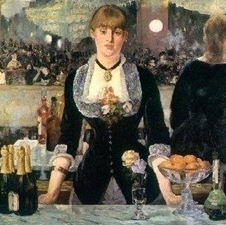 By the way, here is a painting by well-known French painter Manet entitled “the Bar at the Folies Bergere”.